Below are common attributes associated to Bordeaux Dwarf Yaupon Holly. Become a care taker for Bordeaux Dwarf Yaupon Holly! Below are member comments regarding how to plant Bordeaux Dwarf Yaupon Holly. No comments have been posted regarding how to plant Bordeaux Dwarf Yaupon Holly. Be the first! 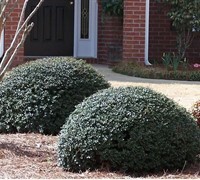 Do you know how to plant Bordeaux Dwarf Yaupon Holly? Below are member comments regarding how to prune Bordeaux Dwarf Yaupon Holly. No comments have been posted regarding how to prune Bordeaux Dwarf Yaupon Holly. Be the first! Do you know how to prune Bordeaux Dwarf Yaupon Holly? Below are member comments regarding how to fertilize Bordeaux Dwarf Yaupon Holly. No comments have been posted regarding how to fertilize Bordeaux Dwarf Yaupon Holly. Be the first! Do you know how to fertlize and water Bordeaux Dwarf Yaupon Holly? Below are member comments regarding how to deal with Bordeaux Dwarf Yaupon Holly's pests and problems. No comments have been posted regarding how to deal with Bordeaux Dwarf Yaupon Holly's pests and problems. Be the first! Do you know how to deal with pests and problems with Bordeaux Dwarf Yaupon Holly? Looking for Bordeaux Dwarf Yaupon Holly? Get Bordeaux Dwarf Yaupon Holly fresh and large directly from the grower to your garden! Buy Bordeaux Dwarf Yaupon Holly online from the nursery wholesalers and save BIG! Plant Bordeaux Yaupon Holly in well to moderately draining soil in either full sun or light shade. This is one of the best choices among evergreen shrubs for foundation plantings. The plant is very tough and very long-lived. This evergreen shrub requires no pruning, though may be pruned or sheared at any time of year as a formal or informal hedge or specimen, or to remove stray or broken branches. Responds well to shearing without much noticeable scarring of leaves. Left alone, with no pruning, this shrub will form a dense, more natural hedge or shrub. One yearly pruning can easily keep this plant in bounds in most landscape settings. Several shearing a year may be necessary to maintain as a formal hedge. Feed Bordeaux Yaupon Holly in early spring and again in late summer with a well-balanced shrub fertilizer that contains iron and/or sulfur to keep foliage dark green. Bordeaux Dwarf Yaupon Holly has no serious pest or disease problems. It tolerates damp soil better than some other holly. Plant Bordeaux Yaupon holly in well-drained to damp soil in full to mostly sun.